Specialists in the field of precision drilling and explosive blasting, we have qualified shotfirers with experience in controlled explosive blasting and underwater explosive blasting. Cervan Marine has over 25 years experience across Australia in a diverse range of areas and conditions. We offer a full range of drilling and blasting services to the mining, construction and marine industries. Our experience and knowledge allows us to develop the best solutions for your needs utilizing our wide range of specialized personnel and plant. Our expertise allows us to successfully deliver onshore and offshore explosive projects including pipeline trenches to any specifications. 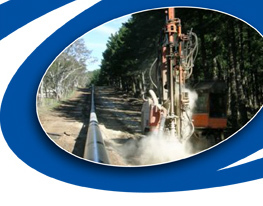 Cervan Marine is the only contractor recognised for drill and blast in close proximity to railway line. If it is precision drilling and blasting you need, then Cervan Marine is the specialist in the field. Cervan Marine completed 2700 metres of sub-sea trench for the installation of a communication cable from Indonesia to Western Australia. Testing was conducted within 500 metres of the Port Hedland Township. We have carried out 6000 square metres of high spot removal in the Port Hedland Port Authority Shipping Channel. Use of explosives to create 2700m of trench 1m deep within 500m of Port Hedland township. Trench was used by Telstra for a communication cable coming into Australia from Indonesia. Client: Port Hedland Port Authority. Drilling and Blasting high spots underwater in Port Hedland Shipping Channel.